During Prime Minister Narendra Modi' Israel visit, India and Israel Thursday have launched a $40 million joint innovation fund to connect start-ups and innovators of the two countries, reports media on Thursday. Prime Minister said that a new chapter has been opened in bilateral ties as deals worth USD 5 billion were signed at the first CEOs Forum of Indian and Israeli companies in Tel Aviv. "A new chapter has been opened in India-Israel relations. The driving force is opportunities for betterment of lives of people," Prime Minister Narendra Modi said while addressing the chief executives of India and Israel. The CEOs Forum set a target of increasing bilateral trade from the current USD 5 billion to USD 20 billion within five years. The Forum also set up six joint committees covering the start-up, pharma and life sciences, homeland security, agriculture, energy and water sectors. 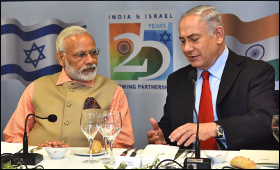 Modi informed Israel's corporate leaders about India having resolved many regulatory and policy issues that were being faced by businesses and companies. "GST is by far the biggest business and economic reform of India. Now, we're moving towards a modern tax regime, which is transparent, stable and predictable," he said. He lauded Israel's reputation as a "start-up nation". "It has a unique sense and ecosystem of innovation and incubation. Credit must go to the Israeli entrepreneurs." "There is a lot of potential for India-Israel partnership in Start-up India. I am happy that India-Israel start-up bridge has been formally launched today," he added. Modi, along with Israeli Premier Benjamin Netanyahu on Thursday launched an India-Israel Innovation Bridge designed to link start-up companies and innovators of the two countries. The bridge is aimed at benefitting Israeli companies and India in areas like agricultural technology, water technology and digital healthcare. While India has 157.35 million hectares of agricultural land, there are over 500 Israeli agricultural technology companies. Similarly, while India is the largest user of ground water, Israel is the largest investor in water technology. There will be over 600 million people seeking affordable healthcare by 2018. Israel, with over 385 companies in the digital health sector, can provide a solution. Modi and Netanyahu started their engagements on Thursday by laying floral wreaths at the Haifa Indian Cemetery that contains the graves of 49 Commonwealth servicemen killed in World War I, 44 of whom were Indians. Haifa was captured by the Mysore and Jodhpur Lancers from Turkish and German forces on September 23, 1918. In a highly sombre atmosphere, Modi and Netanyahu also jointly unveiled a plaque commemorating Major Dalpat Singh, who led the Jodhpur Lancers. On their way from Haifa to Tel Aviv, the two leaders witnessed a demonstration of sea water purification at a mobile desalination plant. The mobile plant can purify up to 20,000 litres of sea water a day and 80,000 litres of brackish, muddy or contaminated river water and bring it to WHO standards. It can be useful in natural disasters like floods, earthquakes, military use in difficult terrain and rural areas to provide drinkable water. Modi also met a group of Indian students in Tel Aviv before leaving for Hamburg, Germany, where he will attend the G20 Summit on July 7-8.